2 0 1 9 J A N U A R Y P R I N T W E A R 3 7 website URL, business name, or other identifier can be beneficial. Your images will even- tually be shared through social media and other channels, and a branded image shows users where to find it should that get lost in the process. The images are also going to show up through the image search feature on search engines. Looking at these details at the end of the year is also a reminder that a new year is ar- riving in short time, and that provides the opportunity to plan for improving strategies and methods. By the time the 2019 holiday season arrives, you could have generated an entire image library that is ready for use in your holiday marketing plans. As a social media manager, my approach is quite mechanical. First, I have a folder of templates for the websites I maintain that are formatted to the correct sizes for the web- site and social media platforms, along with any branding or watermarks needed. Each time I receive a new image, I pull the templates and format/copy/paste the image into each template along with the branding if it is used. I then save them with the proper tags in the file name (part number/description, website, Facebook, Twitter, Instagram, etc.). As time passes, the image library grows, and the images are organized into folders and sub-folders, properly named, and easy to reference for future use. By the end of the year, it sure does come in handy for spending less time on images and more time on selling. And throughout the year, I have images at my disposal for posting to social media and more. Storage is cheap through internal/external hard drives and the cloud. And a well-orga- nized, professional image library is comparable to a full toolbox for anyone marketing online. Consider taking your image game to the next level this year. PW Kelly "Rags" Ragland is the owner and operator of Rags to Stitches Productions, a holistic advertising specialty company that provides a range of services, from Web design and development to customized apparel. Read his blog at http://a-stitch.blogspot.com/. 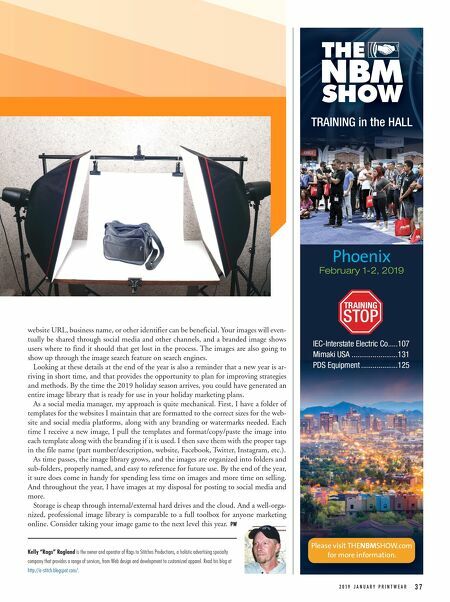 Phoenix February 1-2, 2019 TRAINING in the HALL IEC-Interstate Electric Co .....107 Mimaki USA ........................131 PDS Equipment ...................125 TRAINING STOP TRAINING in the HALL Please visit THENBMSHOW.com for more information.